Win a signed copy of The Laws of Harmony! Back in March I received an e-mail message from Lisa at TLC Book Tours about a new book called The Laws of Harmony. Hmmm, I thought, a self help book. Wait. Judi Hendricks. I know that name. Of course—Judith Ryan Hendricks is the author of the bestselling novel Bread Alone and its sequel, The Baker's Apprentice, two of my favorite books (which both revolve around food and include recipes). How interesting that she's written a self-help book. Okay, nothing slow about me. The Laws of Harmony is not, of course, a self-help book but a novel. The main character is a thirty-two-year-old woman named Sunny Cooper who lives in Albuquerque with her boyfriend Michael, runs a little company called Domestic Obligations, and works as a radio voiceover. Harmony refers to both the name the commune near Taos, New Mexico (called Armonia, which is Spanish for harmony) where Sunny grew up, and a small town on an island off the coast of Washington state where she ends up starting a whole new life. I received my review copy of The Laws of Harmony the same day my hunky farmguy, Joe, arrived home from a few days out of town. I'd been working like crazy for weeks and promised him I would take the entire weekend off (in as much as that's possible when you live with dozens of farm animals). I love novels but couldn't remember the last time I'd had a chance to read more than a few pages of a one at a time. Saturday afternoon found me curled up on the loveseat with my new book, a glass of champagne, and the luxury of several lazy hours stretching ahead. By the second paragraph I was laughing out loud and reading snippets to Joe, and by the time Sunny was describing the medicine bundle necklace she'd worn since she was ten years old on page five, I knew I really liked her. When I first got it, it was filled with the corn pollen that Navajos use in their religious ceremonies, but I kept undoing the blue wool tie and spilling the pollen, so now it just holds my Zuni bear fetish, carved from turquoise with an inlaid white shell heart line that represents the path to power in his heart. It's my talisman against drunk drivers, muggers, lightning strikes, inoperable brain tumors, falling down the stairs, or being dumped for a twenty-two-year-old cocktail waitress. I don't leave home without it. By the end of the weekend I'd read 270 pages, totally lost myself in both the story and the far away locations (the San Juan islands are one of those places I've fantasized about moving to for years), and felt great. Maybe it was a self-help book after all. While I suppose it would be categorized as 'women's fiction,' there's a little of everything in The Laws of Harmony: friendships, family, mother-daughter struggles (I laughed out loud when Sunny described her aging hippie mother, Gwen, as "like a cat, always attaching herself to the one person in a room who's least likely to want her around") humor, self-discovery, intrigue, deception, secrets and surprises, and tragedy. The story constantly moves back and forth between present day, the recent past, and Sunny's childhood at Armonia. Much of the book is dialogue, which I like. No recipes in this book, but food is ever present. I always love to read about what people are eating, and how food plays a part in their lives. My sidewalk table [in front of the bakery] is just big enough for a book—a silly mystery about drug smuggling written by some local guy—a cup of coffee, and a giant, still-warm chocolate chip cookie, its caramelized edges and gooey chunks of chocolate making me want to cram the whole thing in my mouth at once. I force myself to break off little pieces and chew them slowly until they disappear. This is not the way I learned to eat. Gwen, in spite of her back-to-the-earth lifestyle, had been raised with table manners, which she tried halfheartedly to pass on to Hart and me. But the reality of life at Armonia was, the last one in the dinner line got more rice and less chicken, more lettuce and fewer tomatoes, cukes, mushrooms, and green peppers. I learned to get it while the getting was good, and shovel it in quickly to make room for seconds. I remember the first time I had lunch with Betsy, looking up, suddenly embarrassed by my clean plate, while she was still languidly spearing bites of asparagus, cutting an olive in half and smushing it against a crumb of Roquefort cheese. She's really the one who taught me to savor food, all the contrasting aromas, tastes, textures. A few days later I'd finished the book and was relaying the rest of the story to Joe as we walked through the creekbed on our way back from checking on the steers. I told him I wasn't sure what to say in my review, which I reminded him would part of an official online book tour. "I suppose there must be a happy medium somewhere between describing the entire plot—you know I don't read the back covers of novels and can't stand how movie previews always give the story away—and simply saying, 'I really liked this book, and you might, too.'" "So it basically just tells about what happens to this girl from day to day?" "No. Well, yeah. I mean, I guess. Well, no. It's not like the mysteries or thrillers you read where you're racing through the pages to find out what happens. I guess there must be certain ways you're supposed to judge a novel, but I have no idea what they are. All I know is that these characters are likable and believable, and I was interested in what happened to them. When I got to the end of the book, I wished there were another 480 pages." "Then that's what you should say in your review!" And now if you'll excuse me, I do believe today is a holiday. And since it just started pouring down rain, it's going to be a while before I can go out and plant one of the raised beds in the kitchen garden with the eggplant, sweet pepper, and basil seedlings in the greenhouse that are dying to be liberated from their cramped little plastic containers. What a perfect excuse to curl up on the loveseat and take another trip back to Harmony. Happy hour, anyone? Would you like to win a signed copy of The Laws of Harmony? To enter, leave a comment in this post telling us about one of your favorite novels in which food is featured in some way. If you can't think of one, then simply tell us why you'd like to win this book! You can enter through next Sunday, May 31st, and I'll announce a random winner on Monday, June 1st. Please check back to see if you've won, especially if I have no way to get a hold of you (for example, if you have a blogger profile, is it public and does it list your correct e-mail address?). Sorry, but the book can only be shipped to a U.S. address. © Copyright 2009 FarmgirlFare.com, the book-loving foodie farm blog where Farmgirl Susan shares recipes, stories and photos from her crazy country life on 240 remote Missouri acres. I love to run across recipes in books, but never try them out. The book sounds lovely though, and I'd love to have a copy. Chocolat by Joanne Harris. Loved the movie, love the book. I just recently picked up the sequel and can't wait to get sucked into the world of Vianne again. Ooooh this sounds like a divine book! Since I moved to Seattle less than two years ago, I am still thrilling at reading books that have local areas featured in them. That is one reason I'd love to win this book...the other reason is because you made it sound so darn good! I always love a great read. Mixing great chick lit with good food sounds like a perfect combination. The Redwall series by Brian Jacques has lots of food mentioned in it. Those little creatures have at least two feasts in every novel! His descriptions make nut pie, berry cobbler, and veggie soup sound fantastic! Would love a book featuring food! I am enjoying your blog -- the lovely pictures, recipes and prose. I've read a few novels that feature food -- mostly the culinary mysteries that have become popular lately -- but I think my favorite novel that features food and cooking as a major component is Nora Ephron's Heartburn. The novel is funny and sad, and features, among other themes, the search for the perfect vinaigrette. I'd love to win a good novel -- thanks for the opportunity to try, and for inspiring me to think about my favorite food book. I just finished Jodi Picoult's new novel "Handle with Care" and there were some delicious-sounding recipes in there that I'd like to try. And it's always a happy surprise to open up your blog and find a new recipe posted. I'd love to win this new book by Judi Hendricks (I loved her other books), but I already won something from your site, so I'm offering up my Congratulations to the next lucky winners! Love the kitty and the lucious-looking strawberries - fruit from heaven!! One of my favorite books is 'The Sparrow' by Mary Doria Russell. While it doesn't have food as a central theme to the book, agriculture turns out to be a major cataclysm for tragedy on a new world. It's a great book that deals with the coming together of two alien cultures. So I love To Kill a Mockingbird and I love the following part of the story. in his lap. Then he ducked his head. I read One Hundred Years of Solitude one very rainy summer in Texas. Now THAT was an experience. A very interesting book, though not very food oriented. John Lanchester's novel The Debt to Pleasure. It has food and recipes featured throughout an ominously unfolding tale. Recently read The Time Traveler's Wife and loved it but can't recall much about food in it. I live the movie Chocolat but haven't read the bok, so that's next on my list. 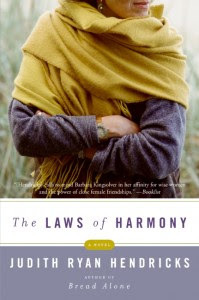 Your synopsis of The Laws of Harmony sounds like it'd be right up my alley, so I'd love to win a copy. So nice of you to promote reading! I enjoy stopping in to your blog. Your entry is very enticing. I'd love to read the book and will look up the author at the library for the other books. When I read Pillars of the Earth, I had that feeling that I just wanted to know more about the characters. My favorite book about food is Under the Tuscan Sun. My dream is to vacation in Italy some day!! I know it is cliche, but Under the Tuscan Sun is the first novel where the food seemed its own character and made me really take notice (Excepting, of course, Amelia Bedelia and her inability to cook properly :)). Oh, this one is easy! "Farmer Boy" by Laura Ingalls Wilder. That book is cram-jammed with mouthwatering descriptions of the food Almanzo Wilder's family raised, cooked, and ate on nearly every page. The daily meals on their farm were of feast-worthy proportions. And even the animal's food sounded delicious; they munched crispy turnip tops, carrots with icy yellow centers, and chunks of ripe pumpkin. Lucky critters! I'll never tire of re-reading this book, because it's such a multilayered treat--it's a charming chronicle of olden times and the adventures of a young farm boy who married one of my favorite authors, and it's a sensory delight for any food-lover. gal. Have you found your rosemary arp yet? Well that sounds fun. I've only just started the school of essential ingredients, where food is featured heavily, although I think my favourite novel is Bel Canto, where food is definitely mentioned as its one distraction for the hostages. Like you, it's been ages since I've read a novel. This one sounds like one I would love and not put down till I'd read it cover to cover. Please include me in the drawing. I just finished reading "Moon Over Madeline Island" and "Return to Madeline Island" and it was often mentioned that Ruby was a great cook and what she had prepared. Sounded delicious! It seems they and their neighbors were always cooking and eating. I do love a good book! I just finished reading "Moon Over Madeline Island" and "Return to Madeline Island." They were much fun. It is mentioned that Ruby is a great cook and talked about what she was making at the time and how she could pull a delicious meal out of thin air practically. Also, the neighbor gentleman were either coming to their house to eat, or they were going to the fellows house to eat. Very enjoyable. Thanks for the opportunity to win this book. however if you are promoting a cause or helping fund raise there is never any issue with people in Canada contributing. Surely in the spirit of fairness you could mail a book to Canada.....if you mark it as a gift it is duty free. I love a good book and a good free book -- even better! I love Peter Mayle's books, especially the first one I read--A Year in Provence. I'm going to the library to take a look at some of the books mentioned in the comments. Thanks for the giveaway and the book reviews. My word verification is readit. It must be a sign. I read 'Laws' last week while on staycation. I really enjoyed it too, great book! I am always on the search for a good book - this sounds like my kind of reading - with food! I enjoy the Aunt Dimity mysteries by Nancy Atherton. The character is an American living in England and there is a recipe at then end of every book - usually something you could have with tea. Great review, Susan! I'm so happy you enjoyed The Laws of Harmony. Your hunky farmguy gave you good advice about what to say about the book!! Thanks so much. Alright, so this is an odd answer, but it's the one that popped in my head! I remember even the first time I read "James and the Giant Peach" back in 2nd grade drooling over their descriptions of the juicy, ripe giant peach, and just craving a piece for myself. However, really enjoyed "The Sourdough Wars". Light, quick, mystery read. I have a couple of quilting books that have recipes in them but like "Ellen" i have not tried them. the book does sound interesting and I would like to read it. I do a lot of listening to book on audio. but have recently started picking up a book at night right before I go to bed and I read about a chapter,then go to sleep. I did not realize how much i missed doing that. I have been on a food book reading kick lately, so it is difficult to choose a favorite, but I would have to say I really liked one called "Plenty - One Man, One Woman, and a Raucous Year of Eating Locally" by Alisa Smith and J.B. Mackinnon. I would be elated to add Ms. Hendrick's book to my reading list! OK, it's not a novel, but I loved reading Barbara Kingsolver's "Animal, Vegetable, Miracle"! She's such a great storyteller so it was an absolute pleasure to read. She included awesome recipes and made my mouth water! I laughed, I cried, and I want to become a gardener more than ever! I loved The Life Of Bees. Honey and life -- too much is overwhelming and bitter, either way. I love novels in which I can dream about living by the water going to little cafe's to get my favorite foods. I can imagine myself living there. I loved the book by Nora Roberts...Face the Fire, but it was a trilogy and all three books were great. I enjoyed the Harry Potter books and especially liked her descriptions of all the mountains of magically delicious food that the students had at their various holiday feasts. I have been interested in Judith's books, but have not read one. I would love to win this book. Thanks for the chance! A lot of my favorite novels involve food...Judith Hendricks just happens to have written 4 of them!! Yes, I just finished reading this book, but I got it from the library and I'd love to own a copy to add the her other 3 I've collected. I seriously contemplated moving to the NW to become a baker after reading Bread Alone & The Baker's Apprentice! I remember reading Heidi when I was little and they went up to the mountains with fresh cheese,jam, butter, and brown bread. Somehow that just sounded so good to me. Oh, sounds like an exciting book. I am currently reading Animals, Vegetables, Miracle. Although, it is non-fiction there are some great recipes. I am just about done with this book (like 4 more pages to go). I need a new read, please! (I'm a new reader to your blogs and love them both!!) I love Jan Karon's Mitford series of books--there's so much food in them that she finally wrote a cookbook, and it's on my kitchen counter. I also remember reading Patricia Cornwell's series of books about Kay Scarpetta (before I realized I can't read scary books! ), and the main character really appreciated good food. I always came away wanting some really good cheese and Italian cooking! Thanks for all the book recommendations--I'm off to see if my library has any of these! I love Diana Mott Davidson's Goldy the Caterer books. The main character is Goldy Bear, a Colorado caterer whose business is Goldilocks' Catering - "where everything is just right". She also has an abusive doctor ex-husband, a wild and fun best friend (also the ex of the abusive jerk), a teenage son, and a hunky policeman boyfriend. The chapters of each book include recipes mentioned in the stories. The books are not "serious" reading, but after a long day, they are just the thing! I would love to have a copy of this book!!! Animal, Vegetable, Miracle would be one of my favorite books that has to do with food. I loved Bread Alone, and it's still the source of one of my favorite bread recipes ever. I loved "Blessed are the Cheesemakers" by Sarah-Kate Lynch. A great book about artisanal cheese-making in Ireland. Fantastic! I have just discovered your blog, and am enjoying reading the archives. Thank you for sharing with us! oh how i wish i was going to spend some time tomorrow sitting at that table eating a still warm chocolate chip cookie. yuuuummm. She's Come Undone, by Wally Lamb. While a good portion of the novel, Dolores is unhappy and unhealthily overweight (is that even a real term), she learns to enjoy food and life. Every time I read that book, it makes me laugh and cry. This book sounds awesome! I love the book Blackberry Wine by Joanne Harris - also Chocolate. Actually, there are lots of books to choose from - can't remember them all. Sure enjoy your blogs! When I was a child I would read the Little House on the Prarie every summer. I remember the food that was written about very well, it was homemade & homegrown most of the time. I have read and re-read an old book called 'Leaving Home' by Arthur Cavanaugh, which is set in the 1950's. Reading about some of the meals in this book makes my mouth water because this was way before microwaves, fast foods, and lots of food additives. I read "Gumbo Tales" not too long ago and enjoyed it thoroughly. Loved reading the comments, just to pick up "food book" ideas! Thanks for the great review! I love learning about authors I haven't read before. When I tried to think of a book for this comment, Laurie Colwin came to mind. She wrote essays for Gourmet and was also a wonderful novelist. Although she died in 1992 when she was only 48, her books are still in print. However, her novels don't center on food, but they are quite a pleasure to read. I have really enjoy the Aunt Dimity series by Nancy Atherton. They are cozy mysteries and there happen to be references to a special recipe in each one book. The really fun part is the fact that the recipe that shows up in the storyline is featured as a bonus at the end of the book! Aside from that I am a voracious reader and really, really, really need a new book to enjoy! I can't think of novel where the food stuck out to me but this book sounds great! I just finished a book and haven't made it to the library for another one yet. OK, two sentences into your review and I had to go place this book on my library request list. I live in Seattle and am planning my next vacation to New Mexico! Some others here have mentioned Chocolat. I love the movie, never read the book. Also by the same author is "Five Quarters of the Orange" which is a great read. I don't collect too many books, so if I win I'll donate it to the library so others may read it as well! I love Peter Mayle's books about Provence but think they are more memoir than novel so not sure that counts. I love the way he can spend a whole chapter describing a dinner at a nice restaurant. I always do my best to combine reading with eating! I think it has something to do with being completely immersed in the story - by eating what they are eating. I also like "light reads" such as FRIENDSHIP CAKE by Lynne Hinton. A group of "church ladies" gather to create a church cookbook. This books makes me hungry for southern cooking (my roots) like pecan pie, corn relish and sweet potato casserole. I think food and recipes make books just come alive! Would love an excuse to read a wonderful novel, count me in for the drawing! Lovely book. I just received my copy from Amazon and can't wait to read it. I would absolutely love to win a signed copy of The Laws of Harmony. I just stumbled across this fabulous website while looking for a recipe for Beer Bread and I've bookmarked the site. I'm a "farmgirl" myself and I ADORE your writing style and blog! You review books so beautifully, Fig - I always want to read whatever it is you've read, and this is no exception. Since I cannot for the life of me remember the books you've mentioned before that I tracked down and read, I'll mention " The School of Essential Ingredients" I got from the library. Although it verges on soap opera at times, the descriptions of an unusual chef alone in the kitchen, touching the pots, imagining foods and recipes that caress the senses - yeh, kind of like Chocolat or our favorite. the German film ,Mostly Martha. So please put my name in for this - it sounds wonderful! One of my favorite novels is Chocolat by Joanne Harris. Lots of chocolate! I'll have to check out Bread Alone. I love bread...with creamed honey! Please include me in the drawing. Sweet! Many great book reviews and a chance to win a book! The Secret Life of Bees---the sister's recipes for what all to do with honey; Chocolat, ah yum! ; Animal, Vegetable, Miracle by Barbara Kingsolver--humor, food and farming. The story is much deeper and palatable with a great description of the food, if there is a recipe too then I consider that a triple bonus! There was a series of murder mystery books that included a lady running a bed and breakfast and they always included recipes. Can't remember the names but hey i just love browsing a cook book. Have always loved to read all types of books and would like to receive the book! Thanks. My favorite food book (so far) is Like Water for Chocolate by Laura Esquivel. Each chapter starts with a recipe, that recipe sets the stage for that chapter. Great book. "The Friday Night Knitting Club," by Kate Jacobs has a recipe for muffins. The characters talk about food a bit. 'Like Water for Chocolate' by Laura Esquivel is one of the best books with wonderful recipes. I was in Mexico when I started reading the book; within the first chapter, I was sad knowing that the book would soon end. Hi! I just found your blog today... through a friend's blog. I love it! So much fun to read. My favorite "food centered" book.... hhhhmmm, well I LOVE cookbooks, old ones or a new one filled with old recipes. My current favorite is 'Heirloom Baking' by the Brass sisters. I love their little notes with the recipes. My husband and two teenage boys have inhaled every recipe of theirs that I have tried. Thanks Again for the fantastic reading!! Hi there--I just found your blog and I LOVE IT! What wonderful stories and recipes and sharing you do :) My favorite book (not a novel) with food is Barbara Kingsolver's "Animal, Vegetable, Miracle." In addition to good food ideas/recipes, it inspires me to garden!! I'm also looking forward to getting a copy of Bread Alone. I would love to get a copy of The Laws of Harmony--my son is starting school this fall and I will be needing a lighthearted distraction for the first few days! The question is, would I be able to wait that long to read it?! I'm lucky if I get through one book a year these days that doesn't have large colorful pictures and a rhyming verse, but my favorite recent book is "Memoirs of a Geisha." They didn't focus on foods, but when she'd describe walking through the streets of the little Japanese towns, she always made sure to mention the aromas of the foods around her. She discusses how geishas must know how to eat properly and pour tea and such. Just an amazing novel. Not here...but somewhere else on your blog....you mentioned you liked the novel Bread Alone. I bought it...and then Hendricks' other three books. I have inhaled them...and lovely long weekend it was! Thank so much for the recommendation. The walnut hearth loaf from Baker Appentice is rising as I type.